Our Chief Steamer is very similar as far as specifications, but these are different machines. Lets start with the basic specifications and similarities. 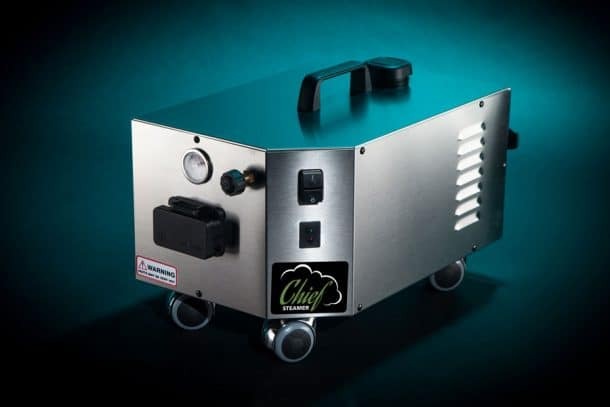 The Chief Steamer Refill 100 uses a smaller 2.0 liter (2.2) quart boiler. The TK1.5 uses a larger 6 quart boiler. We can use the smaller boiler as our machine is a continuous refill. Ours will heat in less than half the time of the TK1.5. A bigger boiler is advantageous in the fact that there is a larger steam reservoir available. But ours recovers fast and there is not a hugely noticeable pressure drop. Big boilers take a long time to heat. We do not need a big boiler with a continuous refill system. Most people prefer a faster heat up time and most people by far prefer the continuous fill system. These machines look far different but produce basically the same amount of steam, at similar temperature, and pressure. We have shown the similarities and the differences where we think we have an advantage. But we have a HUGE advantage in the one key area you may be most interested in……PRICE.